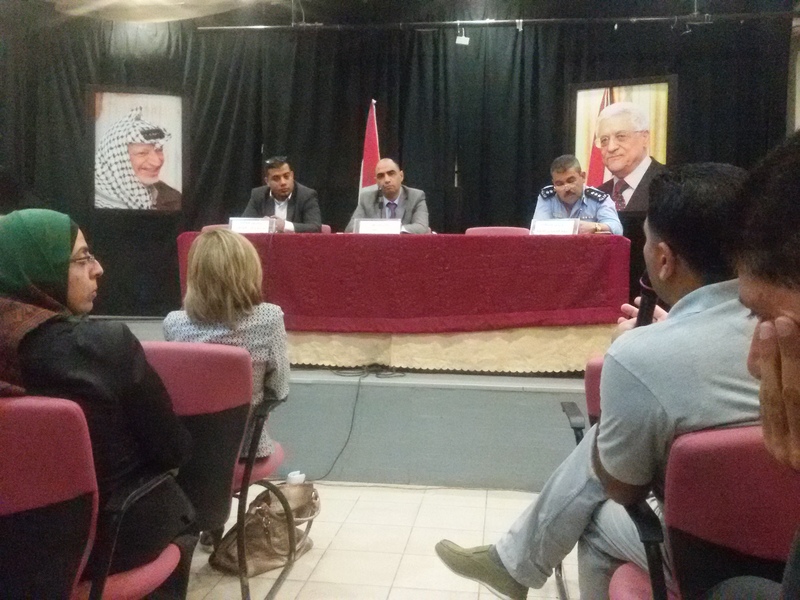 In the 10th of October 2017, the Treatment and Rehabilitation Center for Victims of Torture (“TRC”) organized an open hall community meeting under the EU project “Strengthening Support of UNCAT and OPCAT & OPCAT in Palestinian Authority Legislation to Stimulate a Human Rights-Oriented Palestinian Society” (NEAR-TS/2015/26). The event was hosted in Nablus Cultural Center (Hamdi Mango Center) under the title “Protecting Children against Torture in the light of the Domestic Law and the International Rules”. Over 25 governmental and non-governmental worker, employee, advocate and representative participated in this open hall community meeting, including 5 governmental organizations and another 8 civil society organizations whom work on a variety of human rights issues including the children justice issue. 1. Children police department: Colonel Jihad Hashaikeh, who addressed The effective role of the children police department in preventing torture. 2. Children public prosecution: Prosecutor Adel Masaeid, who addressed the Mechanism for children prevention and protection of torture under the Children protection Act no. (4) of 2016. 3. Al-Amal house for observation and social care: Mr. Shadi Mayyaleh, who addressed The conditions of the Palestinian observation and care center for misdemeanants children. 4. The Independent Commission on Human Rights (ICHR): Advocate Yazan Sawafta, whom addressed The independent observation mechanism and its effective role in the prevention of torture. 5. Treatment and Rehabilitation Center for Victims of Torture (TRC): Mr. Khader Rasras, who addressed The gravity of torture on the psychological health of the children and the importance of the psychological therapy in the rehabilitation process. 6. Defense for Children International (DCI): Advocate Sawsan Slehat, Whom addressed a facts sheet that reflects the conditions of the children rights and conditions of detention. Also, the speakers and the spectators had an hour long discussion, and most of the questions were in regard of the developing of the children justice governmental departments among other questions that discusses contentious legal text and case files. Furthermore, the advocacy coordinator of TRC, Amjad Abu Lafi shared the Opening speech with Mrs. Samah Al-Kharouf whom is a member of Nablus Municipality Counsel. Moreover, the event started at around 10:00 in the morning and was closed at around 1:00 in the evening and it was covered by Al-Quds local media channel and Pal Media. Lastly, we would like to note that each participant was provided with a folder than included a notebook, pen, the event agenda, brochure that was designed by TRC in the past months that discusses several issues in regard of torture.